The Armory Show (March 5 – 8) is one of the largest art fairs in the world. It strives to take advantage of the yearly convergence of the world’s top collectors and art enthusiasts by consolidating and promoting a diverse selection of New York City’s own cultural offerings. In celebration of New York’s unparalleled artistic communities, Armory Arts Week works to highlight the distinct non-profit cultural organizations of our city’s multiple neighborhoods and boroughs. It enters its 17th year at Piers 92 and 94. VIP Preview Wednesday, March 4th. Open to the Public Thursday through Sunday – 12 to 7pm. ADAA’s The Art Show (March 4 – 8) is the art fair organized by the Art Dealers Association of America. This 27th annual show will feature thoughtfully curated solo, two-person, and thematic exhibitions by 72 of the nation’s leading art dealers. Find it at the Park Avenue Armory, Park Avenue and 67th Street, NY. Hours: Wednesday through Friday – 12 to 8pm; Saturday – 12 to 7pm; Sunday – 12 to 5pm. Art on Paper (March 5 – 8) is a new fair from the producers of Miami Project, launching this March in New York City. Its exhibiting galleries will feature work by artists who look to paper as a major influence in their sculpture, drawing, painting, and photography. Working alongside Beneficiary Partner, Brooklyn Museum, and Presenting Partner, The Wall Street Journal, it seeks to bring the best in modern and contemporary art to downtown New York’s Pier 36, located at 548 W 22nd Street, NY. The VIP Party is Thursday, March 5, from 8 to 10:30pm. Hours: Friday – 11am to 7pm; Saturday – 11am to 7pm; Sunday – 11am to 6pm. Moving Image (March 5 – 8) was conceived to offer a unique viewing experience with the excitement and vitality of a fair, while allowing moving image-based artworks to be understood and appreciated on their own terms. Moving Image New York 2015 will feature a selection of international commercial galleries and non-profit institutions presenting single-channel videos, single-channel projections, video sculptures, and other larger video installations. It will be housed in the Waterfront New York Tunnel, 269 11th Avenue. Hours: Thursday through Saturday – 11am to 8pm; Sunday – 11am to 4pm. An opening reception will take place Thursday, March 5th from 6 to 8pm. New City Art Fair (March 5 – 8) will be held at the hpgrp Gallery, 529 W 20th Street 2W, NY. Focusing on contemporary Japanese art, this fair will be held for its fourth edition and wants to globalize the scope of contemporary Asian art to the world amidst the hype at Armory Art Week. Hours: Thursday through Saturday – 12 to 7pm; Sunday – 12 to 6pm. A reception party will be held from 7 to 9pm on on Thursday, March 5th. Pulse (March 5 – 8) has been the “premiere satellite fair for the discovery and acquisition of cutting-edge contemporary art,” according to their website. 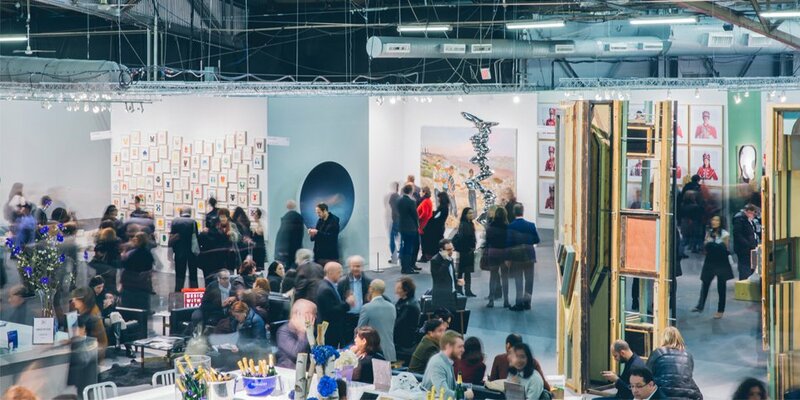 With annual editions in Miami Beach and New York City, the fair cultivates a supportive environment for its international community of galleries and provides a platform for their growth and expansion in the contemporary art market. For 2015, it will be held at The Metropolitan Pavilion, 125 West 18th Street, NY. Scope (March 6 – 8) will commemorate its 15th anniversary in a new location: one block across from The Armory Show piers at Metropolitan Pavilion West, at 639 W 46th Street, NY. SCOPE New York’s convenient and well-appointed venue will host 60 international galleries and a focused schedule of special events, performances and talks to complement its new open-plan exhibition format. Maintaining exhibition square footage and improving useable wall space, galleries will no longer be divided into small booths, but rather, flow beautifully into one another, creating curatorial narratives that encompasses the entire show. Hours: Friday – 6 to 10pm; Saturday through Sunday – 11am to 8pm. Spring/Break Art Show (March 3 – 8) is the new curator-driven art fair during the Armory Arts Week. Through its commitment to the discoveries of local to international curators, SPRING/BREAK Art Show will again offer a unique destination for collectors, artists, galleries, critics, scene junkies & art enthusiasts during the city’s art fair week. Forty curators will premiere new artworks created by over 150 artists, all selected around this year’s central art fair theme, TRANSACTION. The fair will be located at 307 W 31 Street at 8th Avenue, NY. Hours: Wednesday through Saturday – 12 to 8pm; Sunday – 12 to 6pm. A VIP Vernissage will be held from 5 to 8pm on Tuesday, March 3rd. (un)Scene (March 4 – 8) is an art show that wants to bring art back to passion, and away from the commercialized world it now sits. The schedule of exhibits and events include innovative installations, performance art, painting, sculpture, and participatory pieces “with the goal of celebrating the spirit that underlies the work of the creative process.” Find it at 549 W 52nd Street, NY. Hours: Wednesday through Sunday – 11am to 8pm. VIP Preview, Wednesday, March 4th. Volta (March 5 – 8) art fair will be held at Pier 90, 711 12th Avenue at 55th Street, NY. An invitational solo project fair for contemporary art, it is the American incarnation of the original Volta show, which was founded in Basel in 2005. The exhibition showcases relevant contemporary art positions regardless of the artist’s or gallery’s age. By refocusing on artists through solo projects, Volta NY promotes a deep exploration of the work of its selected participants. Hours: Friday through Saturday – 12 to 8pm; Sunday – 12 to 7pm. A VIP Preview will be held on Thursday, March 5th from 2 to 4pm, and a public Vernissage from 6 to 8pm.